Anthony Di Pasqua says a simple bandage can be used to apply radiation to a lesion. Image Credit: Jonathan Cohen. Anthony Di Pasqua says a simple bandage can be used to apply radiation to a lesion. Photography: Jonathan Cohen. A sunny week at the beach might make for a delightful vacation, but there’s no joy in the cancer that might arise from too much exposure to ultraviolet rays. Scientists estimate that one in five Americans will develop skin cancer at some point. Many of us will turn to surgery, radiation or both to rid ourselves of potentially dangerous lesions. Skin cancer comes in three varieties. The type you’re least likely to get, melanoma, is also the most likely to metastasize. Far more common are the nonmelanoma skin cancers, mostly basal cell or squamous cell carcinomas. While less deadly than melanoma cancer, these conditions can prove dangerous if not treated promptly. Researchers estimate that cases of nonmelanoma skin cancers will double by 2030. 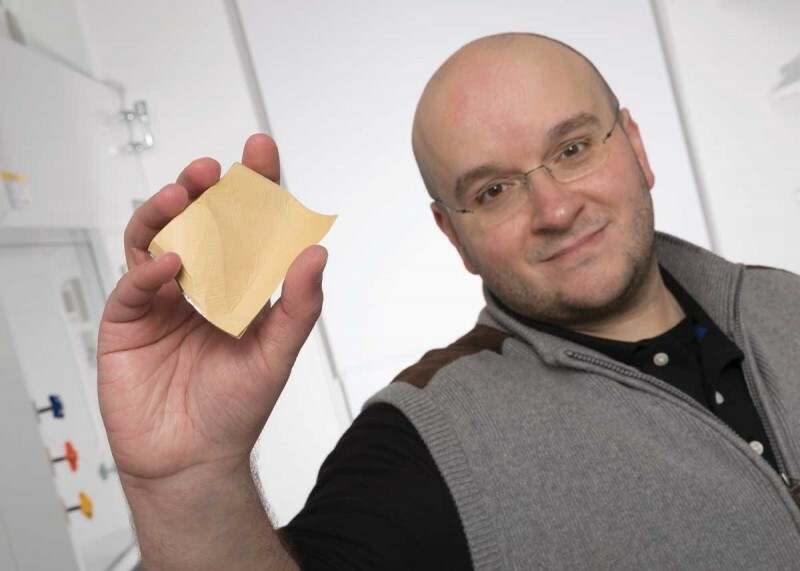 Di Pasqua and his collaborator, Kenneth Balkus, professor of chemistry at the University of Texas at Dallas, want to replace the machinery with an adhesive bandage infused with radioactive nanoparticles made from an element called holmium. “You can make the bandages while the holmium is nonradioactive, so you can produce them in large quantities and store them,” Di Pasqua says. As needed, DB Therapeutics will send bandages to a reactor center, which will bombard them with neutrons. That turns holmium-165 into radioactive holmium-166, which emits beta particles and gamma photons. “The beta particles damage the DNA of cancer cells,” he says. A doctor who orders bandages for a patient can use a gamma counter to measure the rate at which the holmium emits gamma photons, confirming the dose of radiation in the bandage. Before treatment, the doctor will order a specific-sized bandage, so the radioactive surface matches the size and shape of the lesion. This will ensure that only the lesion receives radiation, reducing the chance of damaging healthy skin surrounding the cancer. Di Pasqua and Balkus have used the bandages successfully on mice to shrink nonmelanoma skin cancers. When using the bandages on humans, instead of sending each skin cancer patient to a procedure room with X-ray equipment, physicians will treat multiple patients in a room set up like a lounge. “The bandage is simply placed on the patient. They can relax in a comfortable chair in a regular room and read magazines or watch TV,” Di Pasqua says. A patient will come in for several treatments, each lasting less than two hours. In some cases, physicians might use the therapeutic bandages instead of surgery. Not only will the treatment be more pleasant for patients, but it could eliminate the need to travel to a specially equipped facility. With the bandages and a license to employ radiation, a dermatologist could treat nonmelanoma skin cancers right in his or her office. Di Pasqua and Balkus developed the radiotherapeutic bandages while Di Pasqua served on the faculty of the College of Pharmacy at the University of North Texas, in Fort Worth. At Binghamton, he has been working on a gel that might someday be used on skin cancers either alone or together with the bandage. “Having different options is always good — whatever is best for the lesion,” he says. A native of central New York, Di Pasqua came to Binghamton from Texas in order to live closer to his family. “But I also liked that the School of Pharmacy and Pharmaceutical Sciences is developing a very strong research program,” he says. While teaching courses and pursuing new research, Di Pasqua also will devote time to DB Therapeutics. In August, the company received a significant investment to help the invention make the transition from lab to clinic. DB Therapeutics has hired an employee — one of Balkus’ former grad students — to develop best practices for manufacturing the therapeutic bandages. Once the company has that process nailed down, it will be able to contract with a vendor to produce bandages for sale. All tenants in the Southern Tier Incubator, and in the University’s Start-Up Suite in the Innovative Technologies Complex, receive mentoring from local experts in fields such as finance and marketing, says Per Stromhaug, assistant vice president for entrepreneurship and economic development at Binghamton.